FOREX Markets have been operating since international currencies were allowed to float freely in 1973. In the 35 years since then, they have been currencies were allowed to float freely in 1973, the foreign currency exchange market has been gathering momentum at an astounding pace. 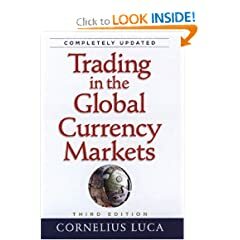 Understanding these markets is critical and the book by Cornelius Luca entitled 'Trading in the Global Currency Markets' is a fantastic overview of this complex and constantly evolving market place. Inside this book, a student of the Markets can find analysis of the markets, the mechanics of how they work and the major players on those markets. In addition, there are examinations of the risks involved with the FOREX markets, the dangers of corporate-level trading, the various methods of executing a trade and settling the deal. The author takes the time to give detail to these critical basic understanding. This allows the reader to follow along as the book enters more complicated subjects such as foreign exchange instruments and major option strategies and the three major types of FOREX analysis. Also included, are several FOREX scenarios, each with multiple points of perspective, such as the Trader, the Broker and the Corporate Trader, to allow the reader to understand the situation from every angle. Later chapters discuss important information about the highly aggressive 'Hedge Funds' that have become impressive instruments in the FOREX marketplace and a further detailed explanation of various charting options and how to understand them. This book, an invaluable resource for any trader or prospective trader, provides a necessary historical context to understand the fundamentals and base concepts of FOREX trading, poses and then answers a wide array of questions both basic and advanced, making it a tool that is fitting for both the novice and the experienced trader. The author is able to relate his years of experience in the international monetary markets in a fashion that is both crisp and informative without being dry and boring. The author is able to fully explain the complex inner workings of the Currency Markets in a fashion that even a layman can understand and appreciate. 'Trading in the Global Currency Markets' is now in its expanded and updated second edition, allowing it to grow and change as the markets do, retaining a powerful and necessary resource. It continues to deliver informative, concise information without burying it under jargon or information-bloat. Cornelius Luca is a recognized FOREX expert with two decades of experience in international finance. He is the author of Technical Analysis Applications in the Global Currency Markets, and teaches at the New York Institute of Finance. Cornelius has developed, lectured and administrated seminars on Foreign Exchange, Technical Analysis and the Capital Markets since 1990.